A political action committee linked to House Minority Leader Nancy Pelosi (D., Calif.) pushed $100,000 to a political action committee primarily financed by liberal billionaire George Soros as part of a campaign led by four activist groups, Federal Election Commission filings show. The House Majority PAC, a Pelosi-affiliated committee dedicated to electing and preserving Democrats in the House of Representatives, sent a $100,000 check to the Win Justice PAC on Sept. 19, according to the PAC's newest filings. The Win Justice federal PAC was created as part of the "Win Justice" campaign that consists of a coalition of four liberal groups—the Center for Community Change Action, Planned Parent Votes, Services Employees International Union (SEIU), and Color of Change—with the intent of pushing infrequent voters to the polls in Florida, Nevada, and Michigan and aiding Democratic politicians in the state. 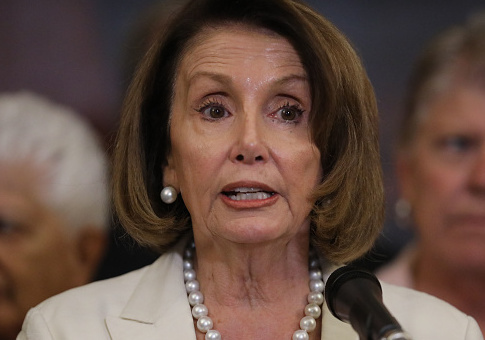 The Washington Free Beacon reported last week that the Pelosi-affiliated PAC on Sept. 24 had sent $5,000 to Win Justice's state PAC in Florida, which is registered to an agent in Tallahassee and whose finances are updated frequently. The campaign also launched PACs in Nevada and Michigan. Win Justice's federal PAC hauled in a total of $4.6 million—$3 million of which came from Soros—prior to the PACs most recent filings. The remaining amount came from the SEIU's PAC and two individual donors, including Jennifer Allan-Soros, Soros's daughter in law. In addition to Pelosi's recent $100,000 contribution, the PAC's newest filings show that Soros added another $2 million on July 20, bringing the financier's total amount given to the PAC to $5 million this cycle. The PAC has now raised a total of $8.3 million. Win Justice's federal PAC is also bankrolled by deep-pocketed Democratic donors S. Donald Sussman, who recently added $1 million, and Hollywood director Steven Spielberg and wife Kate Capshaw, who together gave $100,000 in funding. State Victory Action—a group primarily financed by Soros, Sussman, and Trump impeachment campaign leader Tom Steyer—pushed $200,000 to the PAC. All of those donors have also given to the Florida Win Justice PAC. The federal PAC has disbursed hundreds of thousands in independent expenditures to help endangered Florida Democratic senator Bill Nelson, according to filings. The PAC also recently spent nearly $200,000 backing Elissa Slotkin, the Democratic nominee in Michigan's 8th congressional district, and $50,000 on canvassing services in support of Rep. Jacky Rosen, the Democratic nominee for Senate in Nevada, who polls show down by as many as 7 points to Republican incumbent Dean Heller. The PAC is operated by Deepak Pateriya, the chief of staff at the Center for Community Change. Deepak Bhargava, the executive director of the Center for Community Change, sits on the advisory board of U.S. Programs at Soros's Open Society Foundations. Two of the groups involved with the campaign—the Center for Community Change and Color of Change—are approved organizations of the Democracy Alliance, the left's biggest dark money liberal donor network that was cofounded by Soros. Gara LaMarche, who worked at Soros's Open Society Foundations and is now the president of the Democracy Alliance, sits on the advisory council of the Center for Community Change. Pelosi additionally appeared alongside Soros as a keynote speaker at the Democracy Alliance's secretive fall investment conference last year in California, where the alliance planned out their next steps of the resistance. Pelosi can be linked to the alliance going as far back as 2013, a confidential memorandum sent to Pelosi that year shows. The House Majority PAC did not respond to a request for comment on its donation. This entry was posted in Politics and tagged 2018 Election, George Soros, Nancy Pelosi. Bookmark the permalink.